This weekend I finally took in Takashi Murakami’s exhibition, “The Octopus Eats it’s Own Leg”, at The Museum of Contemporary Art – Chicago. The venue can be hit or miss with the collections and exhibits they carry, but this is by far the strongest I’ve experienced to date. The title of the show comes from an old Japanese saying regarding the cephalopod’s ability to escape danger by chewing off it’s own leg, which in time will regenerate. Murukami’s reinvention and regeneration throughout his career symbolizes this concept. The exhibition encapsulates all the aspects of Takashi’s career; from paintings and character designs to pop culture cross-over projects with the likes of Kanye West and Louis Vuitton. He represents an epic scope of creativity lasting many years and continuing to this day. This is the exhibit’s representation of the artist to me. Wonderfully bizarre characters live in these vibrant environments that I can only describe as the visual result of Akira infecting Photoshop; compositions are full of movement and color, the sheer scale of some of these pieces envelope one’s senses. It really is an augmented and colorful reality viewed through a kaleidoscope of chaos. Even images that may otherwise look disturbing, appear friendly and welcoming due to the almost comic presentation and relentless style Murkami developed through the shared influence of manga and anime. Surprisingly, he never felt talented enough a draftsman to pursue a career in these specific fields but used that influence to create his own world, his own universe. His own characters and realities. The Artist’s relentless creation, and insatiable appetite to produce work across genres and across platforms, inevitably lead to this remarkable retrospective exhibition. 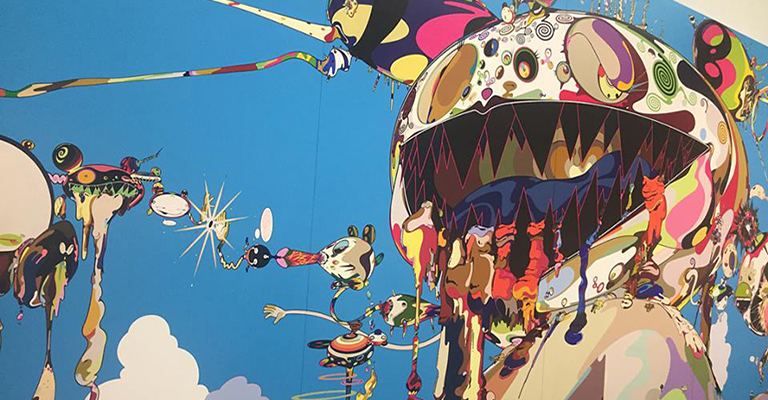 And for Takashi Murakami, there is no end in sight.